I didn’t have enough energy to attend the Toy Fair in NYC this week. Thank goodness for social media! 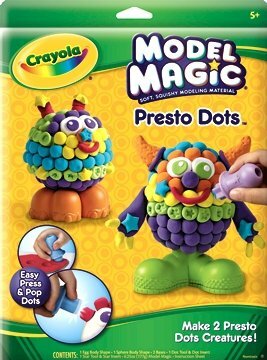 Crayola is offering up a few sneak peeks into their 2010 line – one being the Model Magic Presto Dots. From the imaginations of our color magicians comes Model Magic Presto Dots. A special “pop dot tool” turns Model Magic into puffy, playful pals that are too cute for words. Looks like a lot of fun! Can’t wait for my kids to try it out. And while we are on the subject, did you know that according to a Yale University study, Crayola crayons are one of the top 20 most recognizable scents? It’s #18. WOW!